Happy Galentine’s Day from the Junior League of Boston - The Junior League of Boston, Inc.
What’s Galentine’s Day you ask? 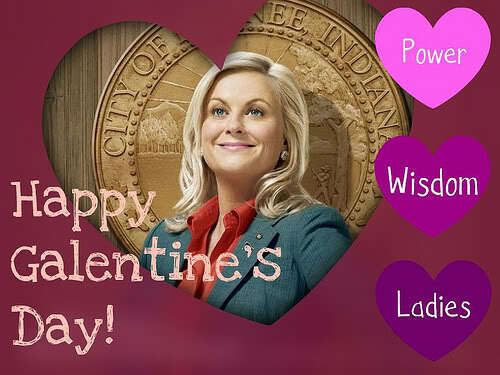 It’s a holiday invented by Leslie Knope, Amy Poehler’s character on the NBC show Parks and Recreation, to celebrate her female friends and to show them how much they mean to her. It is intentionally close to Valentine’s Day (February 13, to be exact) to ensure that we don’t forget our platonic friends when we are gearing up to celebrate our romantic partners. Because the show itself is about strong women (and their equally strong male co-workers) passionately improving their communities, the holiday also celebrates their strength. Lindsey Hyde, Founder of Strong Women, Strong Girls, an organization that provides structured mentorship for elementary school girls by college women who are then mentored by working adults. The Junior League of Boston has been working with Strong Women, Strong Girls since 2012! Ashley Stanley, Founder and Executive Director of Lovin’ Spoonfuls, Inc, a non-profit that rescues perishable food that would otherwise be discarded (think end of the day at the farmer’s market) and brings it to organizations that help the hungry. Malia Lazu, Co-Founder and Executive Director of The Future Boston Alliance, an organization dedicated to improving civic engagement, nurturing the creative economy, and developing the cultural cache of the city. Kit Maloney, CEO and Founder of Collaboratory 4.0, a start up incubator for majority-women owned businesses. So raise a glass to the wonderful women you know and appreciate what they are doing to make Boston (and the world) a better place! While you’re at it, tell us in the comments, on Facebook, and Twitterwhat Boston women you’d like to celebrate for Galentine’s Day. – Lyn Huckabee joined the Junior League of Boston in 2004. In addition to blogging for the organization, she also mentors members in their first year.